A protocol for the synthesis, purification, and characterization of a ruthenium-based inhibitor of mitochondrial calcium uptake is presented. A procedure to evaluate its efficacy in permeabilized mammalian cells is demonstrated. We detail the synthesis and purification of a mitochondrial calcium uptake inhibitor, [(OH2)(NH3)4Ru(µ-O)Ru(NH3)4(OH2)]5+. The optimized synthesis of this compound commences from [Ru(NH3)5Cl]Cl2 in 1 M NH4OH in a closed container, yielding a green solution. Purification is accomplished with cation-exchange chromatography. This compound is characterized and verified to be pure by UV-vis and IR spectroscopy. The mitochondrial calcium uptake inhibitory properties are assessed in permeabilized HeLa cells by fluorescence spectroscopy. Mitochondrial calcium is a key regulator for a number of processes that are critical to normal cell function, including energy production and apoptosis.1,2,3 The mitochondrial calcium uniporter (MCU), an ion transporter protein that resides on the inner mitochondrial membrane, regulates the influx of calcium ions into the mitochondria.4,5,6 Chemical inhibitors of the MCU are valuable tools for continuing efforts to study the function and cellular roles of this transport protein and mitochondrial calcium. The compound [(HCO2)(NH3)4Ru(µ-O)Ru(NH3)4(O2CH)]3+, Ru360, is one of the only known selective inhibitors for the MCU with a reported Kd value of 24 µM.7,8,9,10 This complex is a common impurity found in commercial formulations of ruthenium red (RuRed), a triruthenium di-µ-oxo bridged hexacation of the formula [(NH3)5Ru(µ-O)Ru(NH3)4(µ-O)Ru(NH3)5)]6+, which has also been used as a calcium uptake inhibitor. Although Ru360 is commercially available, it is very costly. Moreover, the synthesis and isolation of Ru360 is challenged by difficult purification procedures and ambiguous characterization methods. We have recently reported alternative procedures to access a Ru360 analogue, [(OH2)(NH3)4Ru(µ-O)Ru(NH3)4(OH2)]Cl5.11 This compound inhibits the MCU with high affinity, similar to Ru360. In this protocol, we will describe our most effective synthesis of this compound, which commences from [Ru(NH3)5Cl]Cl2. Purification of the product using strongly acidic cation-exchange resin is detailed, along with common pitfalls for this procedure. We also present methods for characterization and assessment of compound purity, and delineate a simple approach to test its efficacy in blocking mitochondrial calcium uptake. NOTE: Concentrated acids and bases are used in this synthesis. Use all appropriate safety practices when performing the reaction including the use of engineering controls (fume hood) and personal protective equipment (PPE) including safety glasses, gloves, lab coat, full length pants, and closed-toe shoes. Dissolve 1.00 g of RuCl3·nH2O (40% Ru by weight, 4.1 mmol) in 5 mL of H2O. Cool the dark brown solution to 0 °C in an ice bath. Add 11 mL (0.23 mol) of 80% hydrazine hydrate solution in a dropwise manner. The initial reaction will be vigorous with the evolution gas, resulting in a brown solution. Let the resulting solution stir at room temperature for 16 h; the final solution will be dark red. Caution: Hydrazine is acutely toxic and carcinogenic. Additionally, anhydrous forms of this reagent are explosive. As always, use appropriate PPE and fume hoods when handling. Do not concentrate these solutions to dryness. To this solution, add approximately 5-10 mL of concentrated HCl to adjust the pH to 2. At this point, the solution will be yellow-brown in color. Heat this solution at 105 °C while stirring for 1-2 h. A yellow solid will precipitate out of solution. When no more precipitate visibly forms, remove from heat. Allow the reaction mixture to cool to room temperature, and then place in a 0 °C ice bath for 10 min. Collect the yellow solid by vacuum filtration and wash with 5 mL each of ethanol and diethyl ether. Completely dissolve the crude product in 15-25 mL of hot water. Chill 10 mL of a concentrated HCl solution in a filter flask by placing it in an ice bath. Filter the yellow solution into the chilled HCl solution to induce precipitation of a pale yellow pure solid. Filter this precipitate and wash with 5 mL each of 0.5 M HCl, ethanol and ether. Characterize the compound using IR spectroscopy. Verify purity by the identification of stretching frequencies at 3226 cm-1, 1604 cm-1, 1297 cm-1, and 801 cm-1. A common minor impurity at 2069 cm-1 is assigned to [Ru(NH3)5N2]Cl3. Dissolve 100 mg (0.34 mmol) [Ru(NH3)5Cl]Cl2 in 50 mL of 1 M NH4OH in a 200 mL heavy wall round-bottomed pressure vessel. Loosely cap the flask with a stopper and heat the reaction mixture at 75 °C for 6 h. Remove from heat and stir at room temperature for 4 days to yield a dark green solution. Caution! Heating a sealed vessel results in a pressure build-up. Make sure to use appropriate pressure-safe glassware. For this reaction, the purpose of sealing the vessel is to minimize loss of gaseous NH3. Therefore, place the stopper loosely to allow for release of excess pressure. In a 25 mL beaker, suspend 5 g cation-exchange resin (e.g., Dowex 50WX2 200-400 mesh (H+ form) in 10 mL 0.1 M HCl. Load this slurry into a 10 mL column (10 mm diameter, 15 cm height) affixed with a 50 mL solvent reservoir. Wash the resin with approximately 20-30 mL of 0.1 M HCl, until the eluate is colorless. Return to the green reaction solution isolated in step 1.2.1. To this solution, add concentrated HCl to adjust the pH to 2, at which point the solution color changes to brown. Load this acidified solution to the cation-exchange resin column prepared in step 1.3.2 by gently pipetting it on top of the resin. Let the eluate completely drain, and continue loading the solution. Repeat this process until the entire solution has been added. The top of the resin will be dark brown/black. The resin will decrease in volume slightly. Use glass beads to cover the top of the resin. These will prevent the resin from being disturbed when new solutions are added. Elute the column with 20 mL of 1 M HCl. Elute the column with an increased HCl concentration of 1.5 M (≈ 50 mL). A yellow solution will begin to come off the column. Increase the HCl concentration to 2 M and continue eluting until the eluate is colorless or a very pale green-yellow. A total volume of 150-200 mL will be required for this process. Increase the HCl concentration to 2.5 M (20-50 mL). Collect the eluate as fractions in test tubes. Increase to 3 M HCl. The product will elute from the column as a green-brown solution. A red-brown fraction may also begin to come off of the column. As these fractions are oxidized ruthenium red impurities, do not pool with the green-brown fractions. Test all of the fractions from step 1.3.8. by UV-vis spectroscopy. To accomplish this task, add 100 µL of a given fraction into 2 mL of 3 M NH3 and analyze by UV-vis spectroscopy. Fractions containing pure product will have a large absorbance band at 360 nm and a less intense absorbance at 600 nm. Absorbance at 480 or 533 nm is indicative of oxidized ruthenium red and ruthenium red impurities, respectively. Pool fractions containing pure product and evaporate the solution to dryness by rotary evaporation. The product will be isolated as a green-brown solid. Yields are typically on the order of 5-15 mg (10-20% yield). Single-crystals, suitable for X-ray diffraction, can be obtained by the vapor diffusion of ethanol into aqueous solutions of the compound. To verify purity, analyze the compound by UV-vis spectroscopy in a solution of pH 7.4 phosphate-buffered saline (PBS). Purity may be assessed by taking the ratio of intensity of the 360 nm and 600 nm peaks. This ratio is 31 for a pure compound. For impure compounds, the ratio will be smaller. Analyze the sample in the solid-state by IR spectroscopy. Diagnostic bands are at 3234 cm-1, 3151 cm-1, 1618 cm-1, 1313 cm-1, and 815 cm-1. Common impurity bands are seen at 1762 cm-1 and 1400 cm-1, characteristic of NH4Cl. Ruthenium red can be identified by bands at 1404 cm-1, 1300 cm-1, 1037 cm-1 and 800 cm-1. Caution! The following procedures use mammalian cells. Work should be carried out in appropriate laminar flow hoods that are certified for biological safety level 2 (BSL2) research. Make buffered glucose-containing saline solution (BGSS) as the assay media. BGSS is a solution comprising 110 mM KCl, 1 mM KH2PO4, 1 mM MgCl2, 20 mM 4-(2-hydroxyethyl)-1-piperazineethanesulfonic acid (HEPES), 5 mM sodium succinate, 30 µM ethylene glycol-bis(β-aminoethyl ether)-N,N,N',N'-tetraacetic acid (EGTA). Combine everything except the EGTA, adjust pH to 7.4. Add EGTA and readjust pH to 7.4. For 50 mL of assay media add 0.5 mL of 1 mg/mL glucose. Culture HeLa cells in 500 cm2 Petri dishes in Dulbecco's Modified Eagle Medium (DMEM) with 10% fetal bovine serum (FBS) in a humidified incubator with 5% CO2 at 37 °C. Amplify HeLa cells growing in a 100 mm Petri dish by seeding them in a 500 cm2 petri dish. The total media volume in the large dish is 115 mL. Each large dish will yield approximately 18 million cells, enough for two fluorescence spectroscopy experiments. Count cells using trypan blue and a hemocytometer with an inverted microscope, and calculate the total number of cells and the volume of media needed to reach 7.5 million cells per 1.8 mL volume of medium. Centrifuge the cells for 10 min at 5310 × g. Decant the supernatant and add the calculated volume of BGSS. Resuspend cells gently. For this assay, prepare stock solutions of 40 mM digitonin in dimethyl sulfoxide (DMSO), 1 mM Calcium Green-5N in H2O, and 10 mM CaCl2 in H2O. [Ru] stock solutions, prepared in pure water, can range from 1-3 mM. ​NOTE: Calcium Green-5N is light-sensitive. Store in the dark and minimize light exposure. Setup the fluorimeter to excite at 506 nm and read the emission at 532 nm with the cuvette-holder controlled at 37 °C. Prepare an acrylic cuvette with a stir bar or wheel, 1.8 mL cell suspension from 1.5.2 above, 1.8 µL digitonin solution, 3.6 µL Calcium Green-5N (solution), and 9 µL [Ru] (for 1 mM stock solution, 5 µM final concentration). Incubate cells for 15 min in the fluorimeter. Read the data as the excitation/emission ratio instead of the raw absorption. This practice minimizes errors associated with fluctuations in the light source intensity. Carry out the first sample analysis in the absence of [Ru] to measure the effect of the addition of CaCl2 on the response of the cells. Begin analysis on the fluorimeter with the settings described in 1.5.4. Wait approximately 2 minutes to establish a stable emission baseline, and then add 1.8 µL of CaCl2 (10 µM final concentration). The emission intensity will increase immediately upon the addition of the CaCl2, and will then decay over the course of minutes as the calcium ions enter the mitochondria. Wait until the decay has finished (≈5 min). Add additional calcium boluses to determine the mitochondrial calcium uptake response of cells not treated with [Ru]. In another cuvette containing 5 µM [Ru], repeat the experiment as described above in 1.5.4.3. In the presence of the inhibitor, emission intensity will increase, but not decay. This observation signifies blocked mitochondrial calcium uptake. This method describes a synthesis of the mitochondrial calcium uptake inhibitor [(OH2)(NH3)4Ru(µ-O)Ru(NH3)4(OH2)]Cl5 starting from [Ru(NH3)5Cl]Cl2, a well known ruthenium(III) starting material. 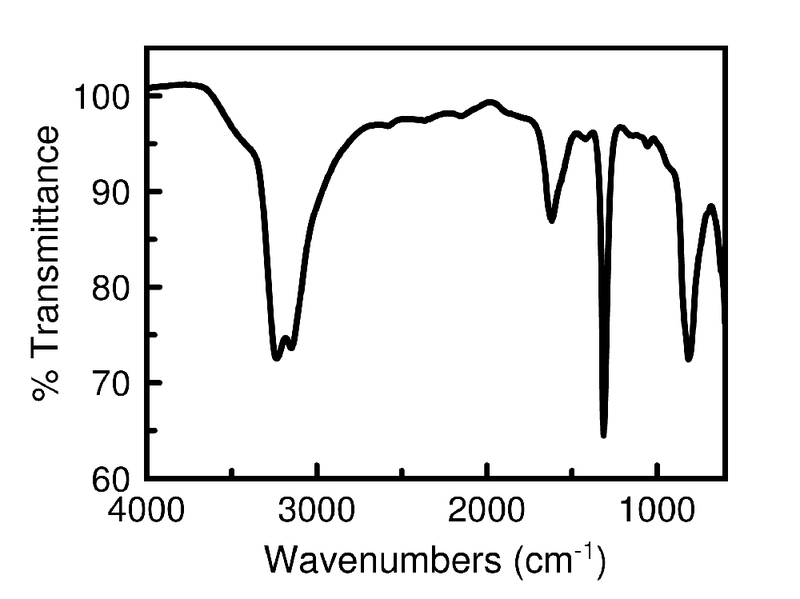 [Ru(NH3)5Cl]Cl2 is characterized by IR spectroscopy, with vibrational modes at 3200 cm-1, 1608 cm-1, 1298 cm-1, and 798 cm-1 (Figure 1). A minor impurity at 2069 cm-1 can be attributed to [Ru(NH3)5N2]Cl3. The reaction of this Ru(III) species with 1 M NH4OH affords [(OH2)(NH3)4Ru(µ-O)Ru(NH3)4(OH2)]Cl5. The progress of this reaction is evidenced by a dramatic change in color of the solution from yellow to green. The final reaction solution is dark green in color. Acidification of this solution with concentrated HCl results in a color change to brown; a byproduct of this neutralization is ammonium chloride, which can contaminate the final product if care is not exercised. Purification of the compound proceeds via cation-exchange chromatography using strongly acidic mesh (H+ form) resin. The resin is equilibrated first with 0.10 M HCl, and the solution of [(OH2)(NH3)4Ru(µ-O)Ru(NH3)4(OH2)]Cl5 is loaded on the column. The ammonium chloride byproduct elutes with the 1 M HCl washings. Ruthenium-containing compounds elute at higher HCl concentrations. A series of yellow fractions, which contain unreacted [Ru(NH3)5Cl]Cl2 starting material, come off of the column when the HCl concentration is 1.5 M. The desired product elutes between 2.5-3.0 M HCl, and the resulting fractions appear green to green-brown in color. Prior to pooling the fractions of the product, their purity should be verified. Because the desired compound exhibits some pH-dependence in its UV-vis spectrum, we suggest adding small aliquots of the fractions to highly basic 3 M NH3 solutions to ensure that the spectral features are the same for all of the fractions. Pure fractions should only display an intense peak at 360 nm and a weak peak at 600 nm (Figure 2). Peaks near 480 and 533 nm indicate the presence of ruthenium brown and red, respectively, and a significant peak at 260 nm, with a shoulder at 290 nm, signifies the presence of [Ru(NH3)5Cl]Cl2 starting material (Figure 3). Rotary evaporation of pure fractions affords the desired compound as a green-brown solid. The isolated compound can further be characterized by both UV-vis and IR spectroscopy. 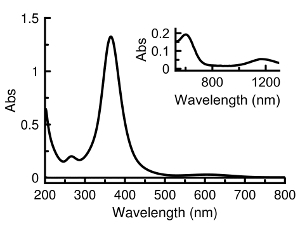 The UV-vis spectrum (Figure 2) displays the 360 nm and 600 nm absorbance bands as described above. The extinction coefficient for the 600 nm band is 850 M-1cm-1 and for the 360 nm band is 27000 M-1cm-1. The ratio of the intensity of the 360 nm band compared to the 600 nm band should be 31 in pH 7.4 PBS, and this metric can effectively be used to gauge the purity of the compound. 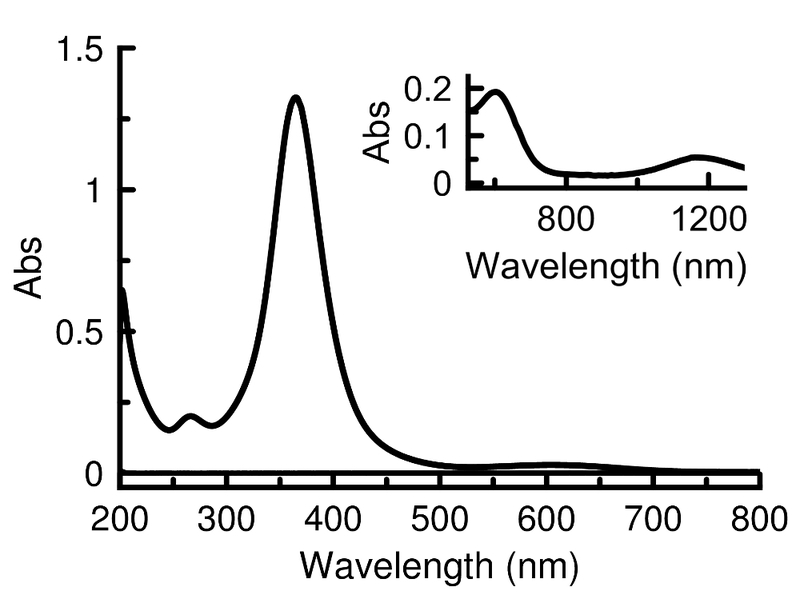 The IR spectrum should appear as shown in Figure 4. The Ru-O-Ru stretching frequency, for example, is diagnostic at 850 cm-1. The IR spectrum was employed to determine the Ru-O-Ru stretch and to ensure no ammonium chloride was present in the final product. Ammonium chloride, a common impurity, has vibrational modes at 1762 cm-1 (very weak) and 1400 cm-1 (strong) that can be easily discerned from the IR spectrum (Figure 5). Ruthenium red is a common byproduct of the reaction and can be identified in the IR spectrum with stretches at 1404 cm-1, 1300 cm-1, 1037 cm-1 and 800 cm-1, although some overlap with the desired product will occur (Figure 6). The calcium uptake response in digitonin-permeabilized HeLa cells is observed (Figure 7). The asterisks indicate the addition of a CaCl2 bolus. In the presence of [(OH2)(NH3)4Ru(µ-O)Ru(NH3)4(OH2)]Cl5 an increase in emission intensity is observed upon calcium addition, but no decay due to mitochondrial calcium uptake is observed. 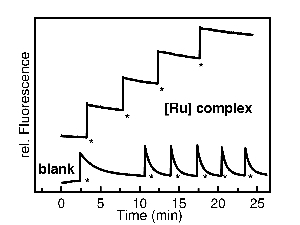 Figure 1: Infrared spectra of [Ru(NH3)5Cl]Cl2. 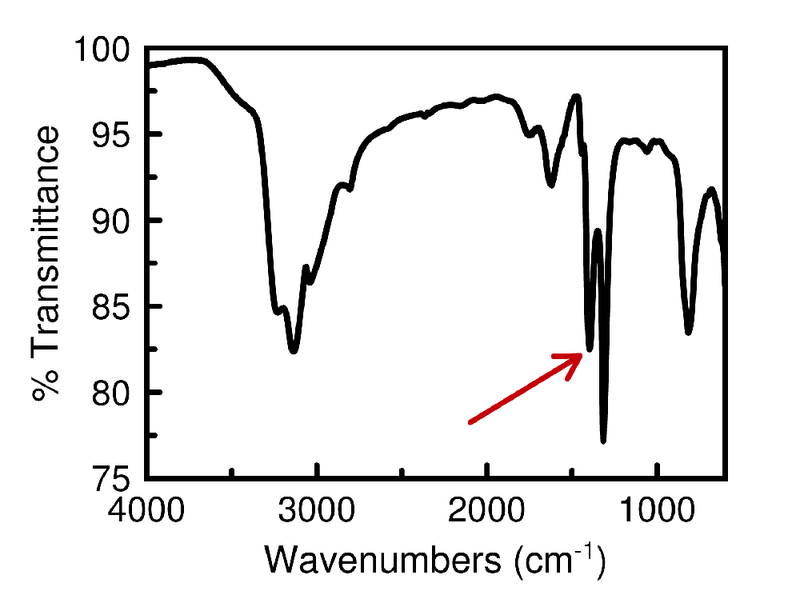 The infrared spectra of [Ru(NH3)5Cl]Cl2 with a very small [Ru(NH3)5N2]Cl3 impurity. The red arrow indicates the impurity at 2,069 cm-1. Please click here to view a larger version of this figure. 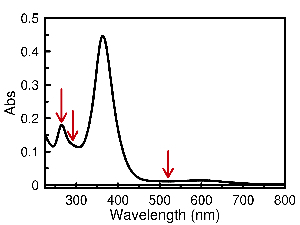 Figure 2: Representative UV-vis spectra for pure material. [(OH2)(NH3)4Ru(µ-O)Ru(NH3)4(OH2)]Cl5 UV-vis absorbance spectra and near infrared (inset) taken in pH 7.4 PBS. The extinction coefficient for the major absorbance at 360 nm is 27,000 M-1 cm-1. Please click here to view a larger version of this figure. 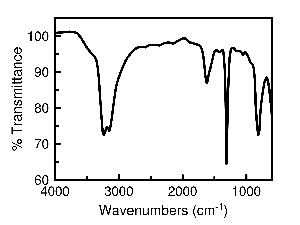 Figure 3: UV-vis spectra of the crude reaction mixture. [(OH2)(NH3)4Ru(µ-O)Ru(NH3)4(OH2)]Cl5 UV-vis absorbance spectra of the crude reaction mixture before purification taken in pH 7.4 PBS. The red arrows indicate common impurities. Please click here to view a larger version of this figure. 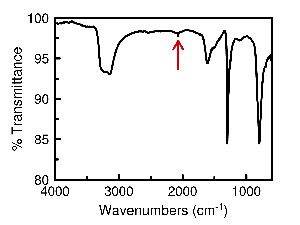 Figure 4: Representative infrared spectra for pure material. The infrared spectra of [(OH2)(NH3)4Ru(µ-O)Ru(NH3)4(OH2)]Cl5. The Ru-O-Ru stretch is at 850 cm-1, the other stretches are from the NH3 oscillators. Please click here to view a larger version of this figure. 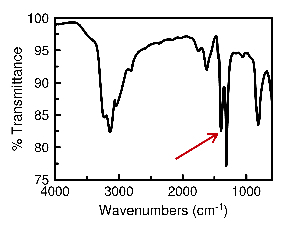 Figure 5: Infrared spectra containing NH4Cl impurities. 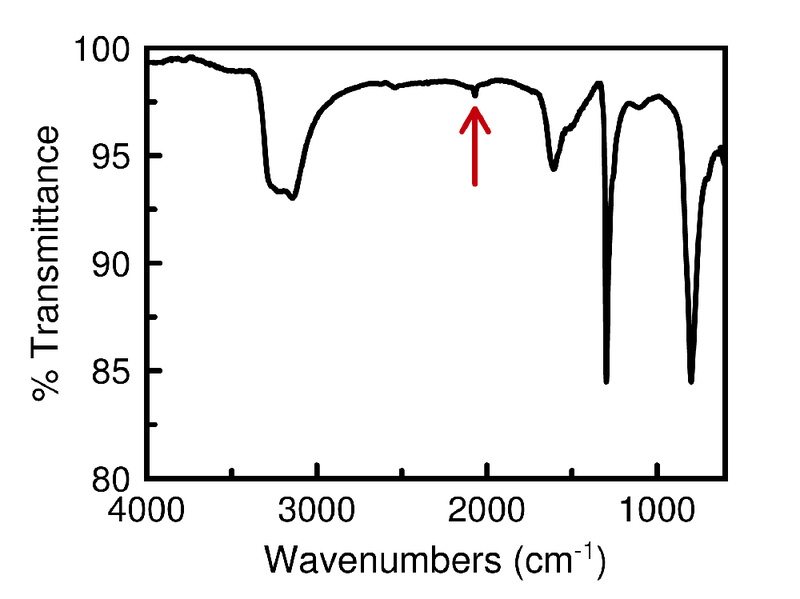 The infrared spectra of [(OH2)(NH3)4Ru(µ-O)Ru(NH3)4(OH2)]Cl5 with ammonium chloride impurity. The red arrow indicates ammonium chloride at 1,400 cm-1. Please click here to view a larger version of this figure. 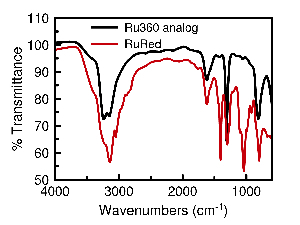 Figure 6: Infrared spectra of commercial ruthenium red. 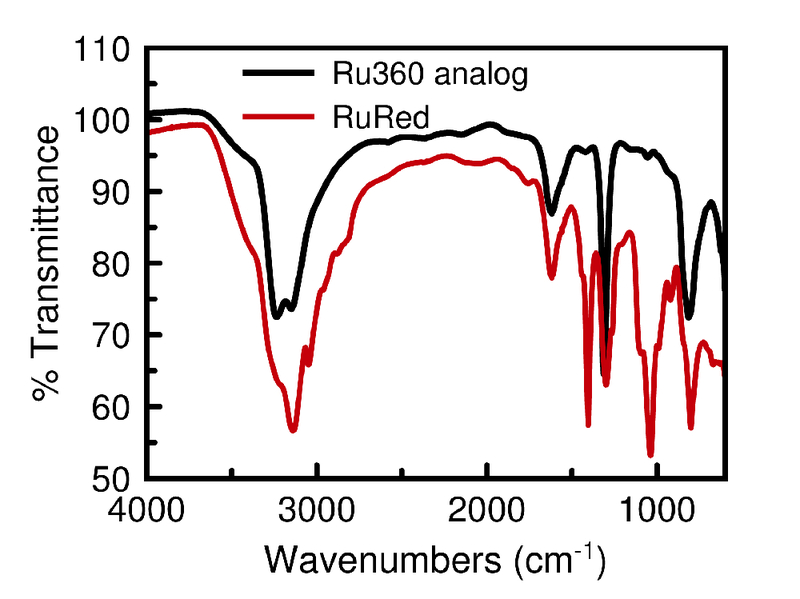 The infrared spectrum of [(OH2)(NH3)4Ru(µ-O)Ru(NH3)4(OH2)]Cl5 (black trace) and commercial ruthenium red (red trace). Please click here to view a larger version of this figure. Figure 7: Representative calcium uptake results. The fluorescence increase due to the addition of calcium to a cocktail of digitonin-permeabilized HeLa cells, Calcium Green-5N and [(OH2)(NH3)4Ru(µ-O)Ru(NH3)4(OH2)]Cl5 in BGSS. The blank contains no [(OH2)(NH3)4Ru(µ-O)Ru(NH3)4(OH2)]Cl5 and fluorescence decrease due to Ca2+ uptake into the mitochondria can be seen. Please click here to view a larger version of this figure. 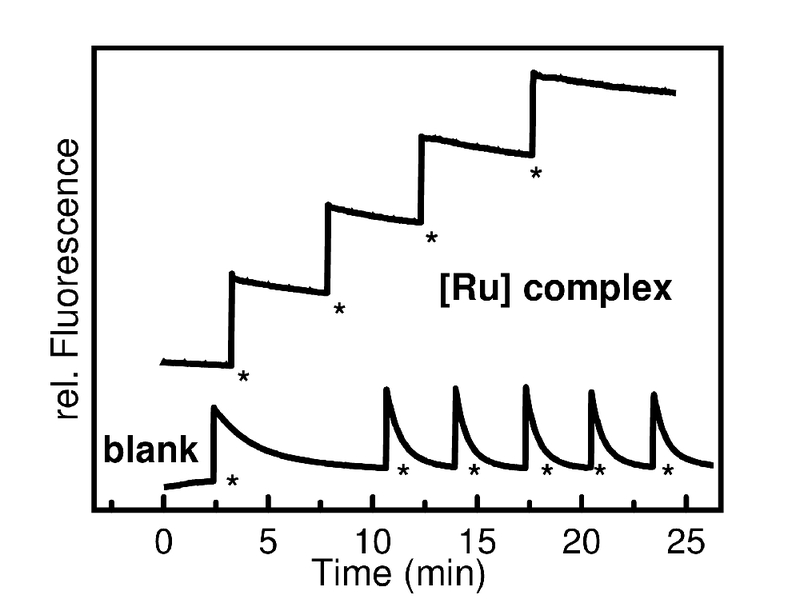 The mitochondrial calcium uptake inhibitor [(OH2)(NH3)4Ru(µ-O)Ru(NH3)4(OH2)]Cl5 can be synthesized from [Ru(NH3)5Cl]Cl2, a well known ruthenium(III) starting material, as described in this procedure. The synthesis of [Ru(NH3)5Cl]Cl2 is readily achieved with little difficulty. After stirring RuCl3 for 16 h in hydrazine hydrate, the pH of the solution should be adjusted to a value of 2 with HCl. The pH drop is critical to achieve the desired product. If desired, this synthesis can be modified to form [Ru(NH3)5Br]Br2 by refluxing in HBr instead of HCl. We have observed some strategies to minimize formation of undesired byproducts during the synthesis of the mitochondrial calcium uptake inhibitor. Notably, keeping the flask capped is critical to the success of this reaction; if the flask is open, a number of other byproducts, including ruthenium red (RuRed), are formed in appreciable quantities. Presumably, gaseous ammonia is lost from the open reaction vessel, and this event compromises formation of the desired product. The size of the flask and the volume of aqueous ammonia are also important parameters that should not be modified significantly from those described in this protocol, as we have noticed that the efficiency of this reaction is decreased in smaller flasks. This method does not drastically increase the yield of this compound in comparison to the other two methods we had previously disclosed. It does, however, contain fewer steps and give rise to less side product formation, such as RuRed. The low yield may be attributed to the presence of a small amount of unreacted [Ru(NH3)5Cl]Cl2 as well as unknown highly charged impurities that are retained at the top of the column. Although we have not explored many additional reaction conditions, it is possible that improvements can be realized by varying the reaction time and the reactant concentrations, to obtain higher yields. The purification of [(OH2)(NH3)4Ru(µ-O)Ru(NH3)4(OH2)]Cl5 is the most tedious and difficult portion of this protocol. A well packed column will greatly assist in the separation; loading the resin as slurry is an effective approach to pack the column. It should be noted that as the HCl concentration is increased over the course of the column elution, the resin will contract in size. To successfully obtain pure material, the rate at which the acid concentration is increased should not deviate from the stated procedure. The final product will be a green-brown solid; a basic solution will be dark green but acidic solutions will be brown. If a bright pink-red solution is observed, ruthenium red contaminations are present. The amount of RuRed can be determined by using the extinction coefficient (62,000 M-1·cm-1 at 533 nm). This purification process is relatively general for strong cation-exchange resin columns. The mitochondrial calcium uptake inhibition can be tested using permeabilized HeLa cells, the fluorescent calcium sensor Calcium Green-5N, and a spectrofluorimeter.13,14 This assay requires a large quantity of cells and therefore necessitate amplification of the culture in a very large 500 cm2 Petri dish. These large culture flasks prevent additional challenges in minimizing microbial contamination because the exposed surface areas are very large. Work should be carried out in a laminar flow cabinet to maintain sterility. The fluorescence response of Calcium Green-5N in permeabilized HeLa cells is monitored by fluorescence spectroscopy. 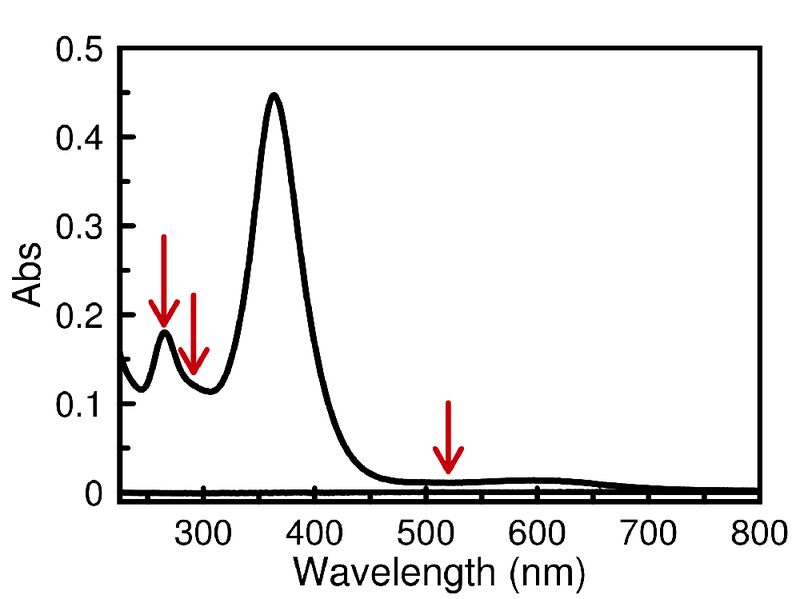 The addition of an external bolus of calcium to the cuvette triggers an immediate increase in fluorescence, arising from the calcium ions interacting with the sensor. Over the course of several minutes in the absence of an inhibitor, the intensity decays due to uptake of these calcium ions in the mitochondria, an organelle that cannot be accessed by the dye. When this assay is carried out in the presence of an inhibitor the addition of a bolus of calcium ions gives rise to an increase in emission intensity. The decay due to mitochondrial calcium uptake, however, is not present, verifying the mitochondrial calcium uptake inhibitory properties of this compound. This process can be used as a general screen for calcium uptake inhibitors. In addition, this procedure can be applied to other eukaryotic cells of interest. This assay depends on the permeabilization of the outer cellular membrane thus does not provide information about the cellular uptake ability of a complex. In summary, this protocol describe the synthesis and purification of a novel ruthenium-based mitochondrial calcium uptake inhibitor. This compound is of significant value for studying the biology of mitochondrial calcium and its role in the physiology of the mammalian cell. The relatively simple assay for testing mitochondrial calcium uptake is also of use for the screening and investigation of new inhibitors. This research was supported by Cornell University. This work made use of the Cornell Center for Materials Research Shared Facilities, which are supported through the NSF MRSEC program (Grant DMR-1120296). S.R.N. acknowledges support by an NSF Graduate Research Fellowship (Grant DGE- 1650441) and Dr. Dave Holowka for assistance with the calcium experiments. Any opinion, findings, and conclusions or recommendations expressed in this material are those of the authors(s) and do not necessarily reflect the views of the National Science Foundation.